To catch up: part one and part two and part three and part four. So, where was I? Ah yes: further progress. On the machine quilting front, I am now down to 3 half feathered wreaths, plus part of a quarter feathered wreath, and then the rest of the pebbling. Oh, and the borders. But that’s a lot further along than when I started this morning. My mini-quilt is not exactly a miniaturization of the original, lap-sized quilt. It’s more of an adaptation. The little one will measure 14 by 20 (ish) when it’s finished. The big one is approximately 56 by 72 (ish). 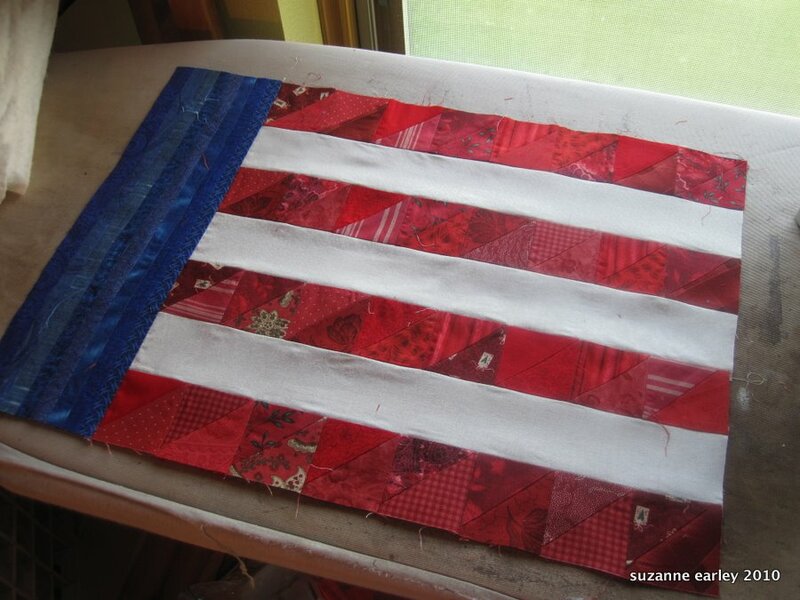 The original quilt has pieced blocks in both the red and white stripes, but I decided that in this smaller version, it would be less distracting to have just a plain strip for the white, rather than the pieced triangles. Of course, there is something missing from the little one, yet…but there is no chance in that hot place that I’m going to applique letters that tiny…I’m not that crazy. No, now it’s time for some embroidery. First…though…I can hear the whip being cracked…better get some more quilting done! 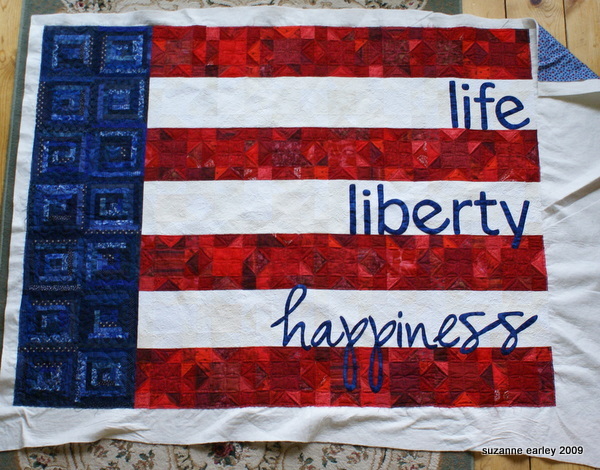 Very cute little quilt! Of course I love the big version too.